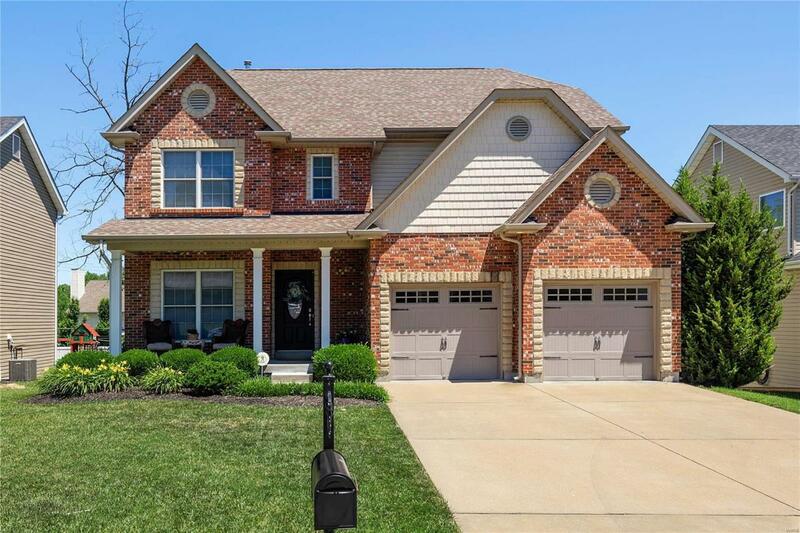 Exceptional brick & stone 2 Sty with remarkable curb appeal! Open floor plan features extensive millwork, custom built-ins & gleaming wood floors throughout the main floor. Impressive hardwood foyer leads to formal dining room with butlers pantry and spacious great room. Designer kitchen with 42 maple Shaker cabinetry, granite countertops, stainless steel appliances & center island adjoins light-filled breakfast room & vaulted hearth room with brick & stone fireplace & atrium door that opens to private deck. The 2nd floor extends the living quarters with sumptuous master bedroom suite with cathedral ceiling, His & Hers walk-in closets & luxury bath with Jacuzzi plus 3 large additional bedrooms & hall full bath. Lower Level entertainment space includes huge recreation room with wet bar, 5th bedroom & full bath. Situated on a professionally landscaped lot with fenced level backyard, deck & 2-car garage. Centrally located just minutes from shopping, restaurants & Des Peres Park & Lodge.